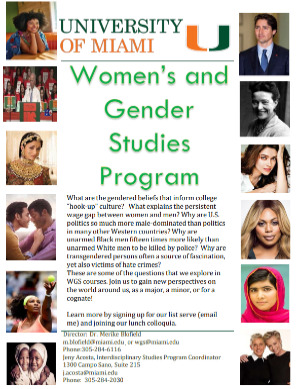 A Women's and Gender Studies minor consists of at least 15 credits in Women's and Gender Studies courses (core, co-listed, and cross-listed) with a grade of C- or better in each course and a cumulative GPA of at least 2.0 in WGS courses. These credits must include at least 9 at the 300 level or above. All minors must complete WGS 201: Introduction to Women's and Gender Studies, WGS 301: Feminist Inquiries, and at least one other WGS core course.